Ever since President Trump won the presidential election, the so-called comedian Chelsea Handler is trying hard to be a “loud voice of opposition” and that is exactly what she is! She was doing stupid things on multiple occasions- she attacked both President Trump and Melania Trump…And now she has a new victim on her list… former White House Communications Director Hope Hicks. 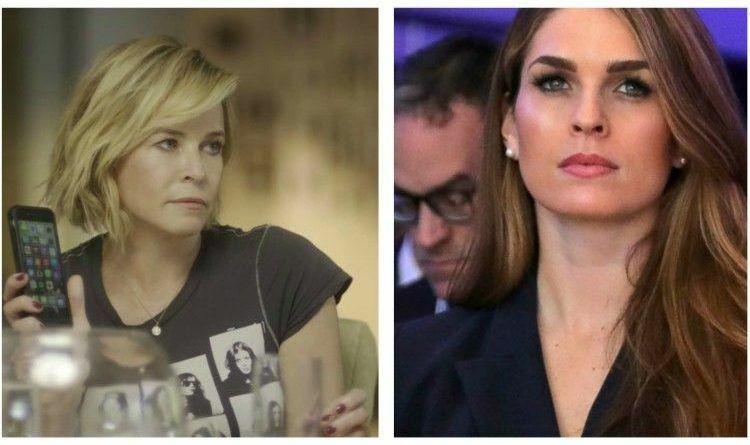 After Hope Hicks, the White House communications director and longtime aide to Donald Trump has announced her resignation, Chelsea Handler made a disgusting joke on her Twitter account. Hope Hicks reportedly kept a detailed diary about her time in the White House. So this will be the second time a woman wrote a diary about Nazis. Well, what can I say…Angry, nasty people on the left. Sad. Is this a sample of women supporting other women? It looks to me that this is the epitome of a low-class jealous person trying to get noticed. If Chelsea didn't get embarrassed when the whole world watched a video of being peed on and enjoyed it. Why would she be embarrassed for showing her ignorance. Do you read what you tweet? I think you have lost touch with reality. Another jackass thing to say that basically insults half the country. Failed “comedian” turned failed “Activist” who basically refers to people as nazis when they don’t agree with her crazy platform. Chelsea is an unapologetic public drunk, uninformed on most issues, who parrots Democrat talking point, who attack’s other women simply because they have different politics than her. And she calls Trump a nazi?